Cape Verde was used by the Portuguese in the 1500’s/1600’s as a midway station for collecting, “seasoning” and reexporting captives born in Upper Guinea to the labour-starved cities, mines and plantations of the Spanish Carribean, Central America, Mexico, Colombia and Peru. Unlike what you might have expected very few slaves exported via Cape Verde were actually going to Brazil in this particular time period. Slave trade from Africa to Brazil started several decades later on than to the Spanish ruled colonies because its economy was less dynamic at first plus it made more use of Native American slave labour. When Brazil’s sugar plantations were in full expansion and requiring massive slave imports from the late 1500’s/early 1600’s onwards, this labour demand was met mostly by the Portuguese slave ports in Angola (Luanda) and secondarily by São Tomé, not by Cape Verde. This outcome can be confirmed by checking the database of slavevoyages.org, even though it’s very much lacking in early Iberian voyages. 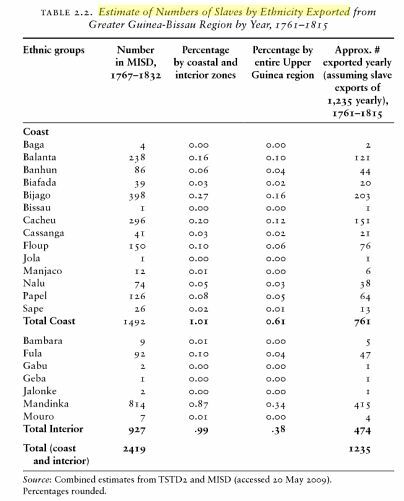 But also several historians have come to this conclusion (among others: Toby Green 2011 and Metcalf 2005) Generally speaking the impact of Upper Guinean slave exports was felt the most in the early 1500’s while in the late 1500’s and early 1600’s Angola became increasingly important, not only for Brazil but also other Latin American countries. During much of this period Portuguese and Spanish colonies were actually part of the same united Iberian empire under the Habsburg dynasty (1580-1640). These charts below show the main patterns well. The first one is taken from Curtin 1969, according to his speculative estimations over 80% of the slave imports to the Americas might have been drawn from Upper Guinea in the early 1500’s. The ethnicities mentioned under Senegambia/Guinea Bissau/Sierra Leone will naturally feature high also among Cape Verde ethnic orgins. A more mixed picture appears for the period 1570-1640 when slave exports via Cape Verde and Upper Guinea were clearly becoming fewer compared with those from Angola but much less so for Cartagena (Colombia) than for Veracruz (Mexico), these two cities being the official ports of entry & distribution of Africans into the Spanish Americas of that time (David Wheat 2009) Prevailing trading winds and sea currents played a big part in this outcome: it being more favourable to sail from Cape Verde to the Hispanic Carribean and from Angola to Brazil. However also political circumstances had a big impact. By the late 1500’s Cape Verde was coming under fierce attack by North Europeans challenging Portuguese monopoly rights in the Upper Guinean area. New slave ports were set up in Senegambia and Sierra Leone by the French and English, while the Portuguese started to focus on the Guinea Bissau/Casamance area, gradually being replaced elsewhere within Upper Guinea (but not so the Luso African traders who also remained active outside of Guinea Bissau up till the 1800’s). Cape Verde’s functioning as a major slave trade port is therefore assumed by historians to have ended in the 1600’s. Cape Verde’s role as primary supplier of slaves to the Hispanic Americas was shortlived and restricted to the 1500’s/ early1600’s. Afterwards other regions like Central Africa (Angola/Congo) and Lower Guinea (Ghana, Benin, Nigeria) became more prominent for the Spanish America’s as a whole, while the major slave traders were no longer Portuguese but first Dutch and then English instead. However economic development and accompanying slave imports were very much differentiated throughout the diverse parts of the Spanish empire. Some colonies accelerating their slave imports after the 1600’s while for others it decreased. 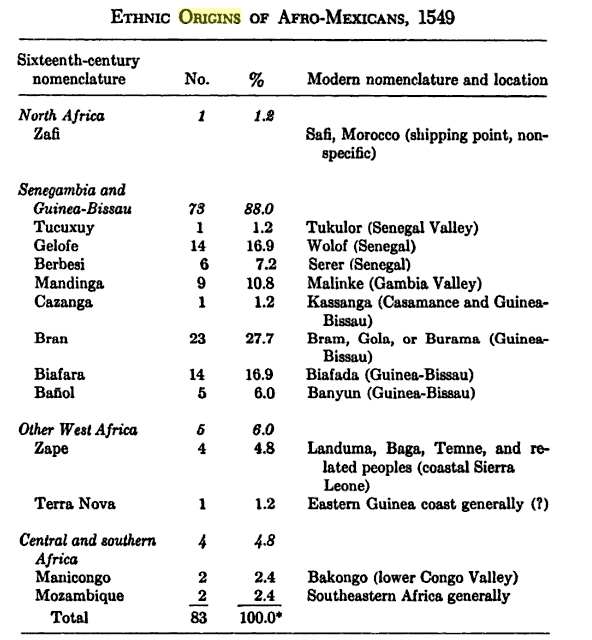 Taken together with locally determined ethnogenesis and racial mixing patterns according to social status it could very well mean that the early slave trade imports from Upper Guinea via Cape Verde in some selected cases of little additional African geneflow might have had a potentially substantial foundereffect, while it will be neglible in other cases. DNA research i will post later on will shed more light on this. These surviving slave registers from the early period (1500’s) are clearly showing the potential for shared ethnic and regional connections between Cape Verde and Hispanic America although again much is dependent on what went on afterwards. Even when the sample size arguably can be quite small, the patterns are pretty much consistent for each country: especially the Bran and Beafada from Guinea Bissau, Zape from Sierra Leone and Mandinga & Wolof from Senegambia. i have posted similar charts over here: http://www.cvraiz.com/?page_id=66 and also in the section “Tables on Ethnic/Regional Origins“. The only regions in Brazil to have received a significant influx of Upper Guinean slaves are located in the very north nearby the Amazone river: Maranhão and Pará. Their geographical position being near the equator also favouring sailing routes coming from the north instead of just from the south like most other parts of Brazil. In the late 1700’s there was a renewed growth in slave trading operations in the Upper Guinea area by the Portuguese. Cape Verde was at this time very much a neglected and impoverished colony, suffering from recurring droughts and no longer reexporting slaves. A majority of Cape Verde’s population consisted of free Africans and their Portuguese mixed descendants living from selfsustaining rural activities already in the early 1700’s as by that time the slave trade had moved on to other parts of mainland Africa. 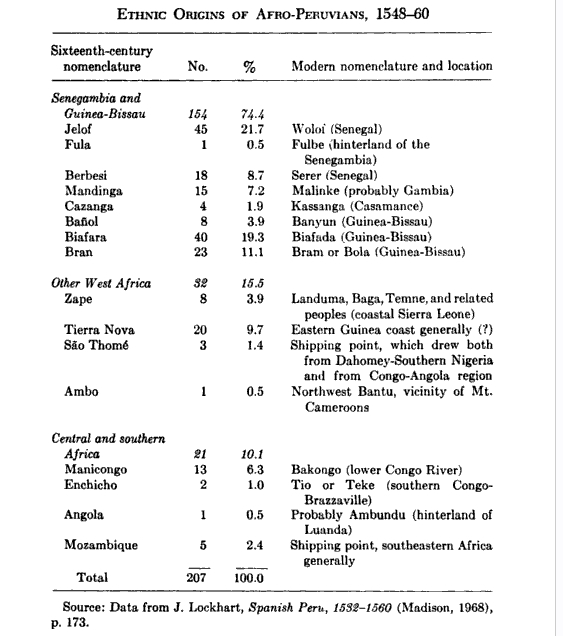 The few slaves that were still needed for the stagnating export sector (cotton, pano textiles and salt) were coming mostly from Guinea Bissau/Casamance (southern Senegal), the same ones that were brought over to northern Brazil at around the same time. First two charts taken from slavevoyages.org. 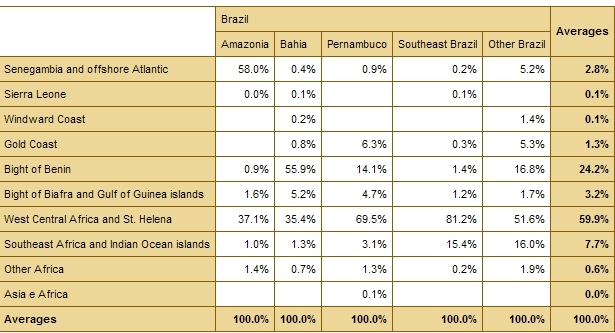 Clearly showing how both in absolute numbers and measured as a % Senegambian imports only mattered for Amazonia (=northern Brazil). 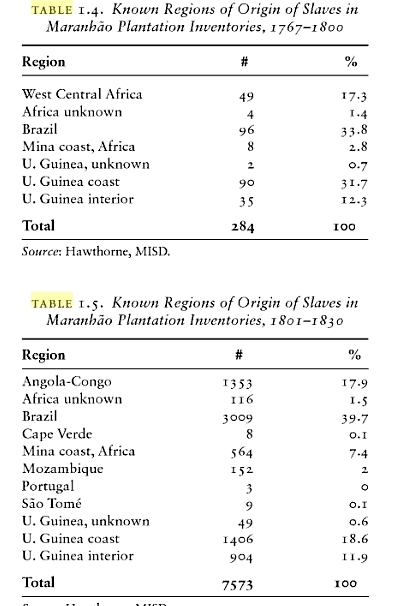 The other charts showing the regional/ethnic origins according to slave inventories from Maranhão, located in northern Brazil. 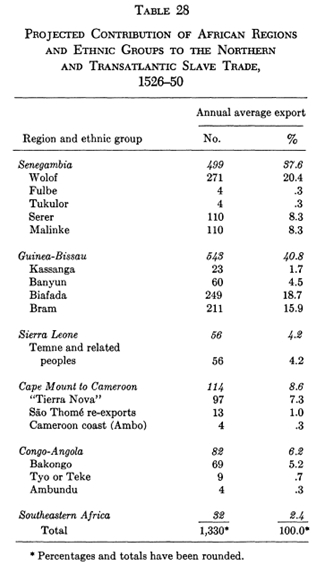 Compared with the ethnic breakdown of the Upper Guinean slaves taken to the Hispanic Americas in the 1500’s, it’s clearly more focused on Guinea Bissau and Casamance although in fact still people from Sierra Leone (“Sape”) and the hinterland of Senegambia (“Bambara” & “Mouros”) are mentioned as well. This entry was posted in Brazil, Cape Verde, Hispanic Americans, Upper Guinea. Bookmark the permalink.